A couple of years ago, there was a Loom Incident. One which involved an estate sale, a huge floor loom, and an Overly Ambitious Fiberartist (OAF for short). We don't speak of it anymore, not since the unnamed OAF found a new home for the HUGE floor loom and obtained a more reasonably sized table loom to learn on. With the help of my fantastic BFF, I got my table loom warped, and a few months later (again with the help of my fantastic BFF) I started weaving. Andrew declared that I needed to finish five projects before I could invest in a bigger/better loom. The warp is Kauni. Not optimal for warp yarn, but pretty. 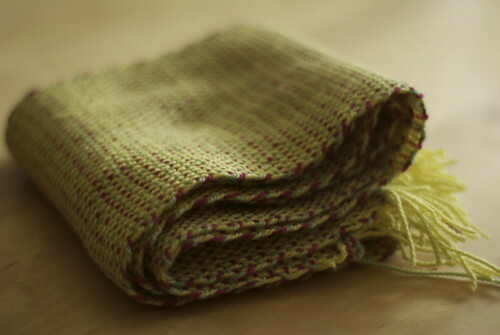 Once I started weaving, I was totally enamored of it. The problem was my loom. 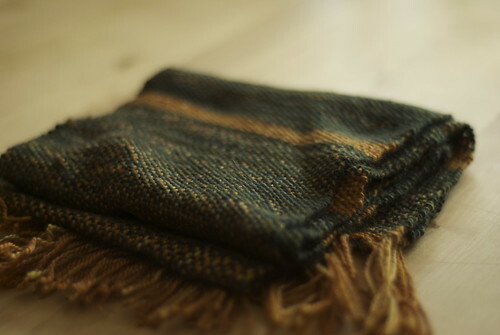 It wasn't in great shape when I bought it, and weaving on it wasn't quiet or soothing. There was actually quite a bit of banging and swearing involved. KillerGuns Kelli picked up a Cricket Loom, and I watched her work on it. Quiet. Small. Light. Brilliant engineering. No swearing. In a podcast-related email to the amazing folks over at Schacht, I mentioned that I had seen a Cricket in person, and that I really needed to get my hands on one to play. Rustic, yes. Definitely a first project, but Andrew strutted around the house wearing it, proud as a peacock. But it was boring, plain tabby, and I felt like the little loom was limited, since all it could do was tabby. 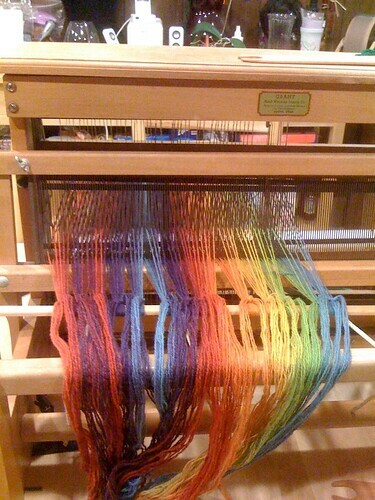 I was at Purlescence, where I mentioned being bored with Tabby, and needing more to do on my loom. 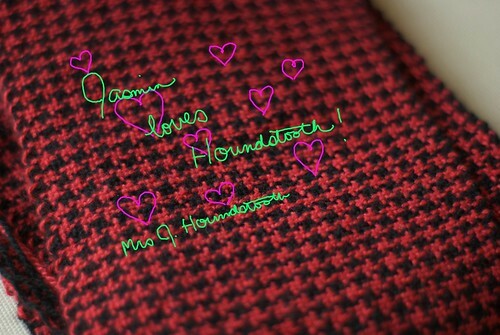 "You can do Houndstooth on your Cricket," Sandi told me, handing me a copy of The Handweaver's Pattern Directory. Lo and behold! The options for my little loom were vast! 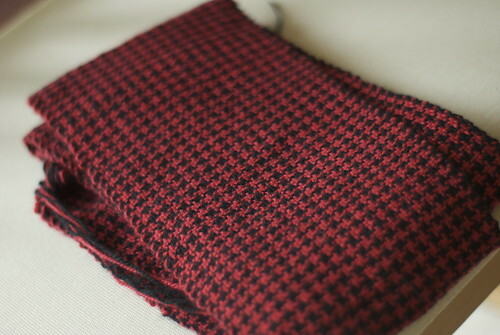 I quickly wove up an incredible Houndstooth scarf for myself, out of cashmere I had in my stash. Can you tell I'm in love? 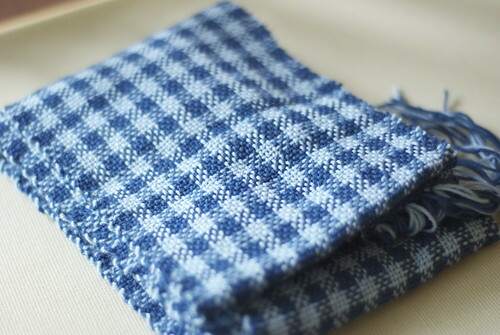 Book in hand, I dove into my stash for the next thing, Gingham. This one had some problems. 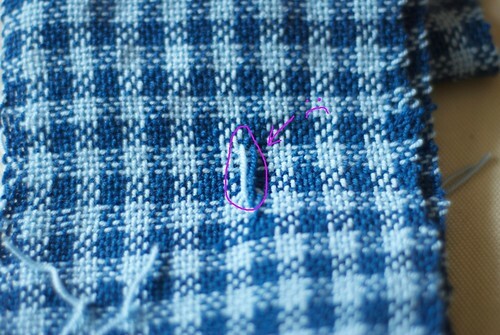 Missed warp threads make me a sad panda. See? I didn't catch it until I was pulling the scarf off the loom, and all I see is the error. I'll wear it, and I'll fix it when I learn how. But it bugs me. Finished Project #4: A Verb for Keeping Warm, Creative base. There seems to be some sort of counter-intuitive-algebra-inspired thing at play here, where three retina-searing colors kind of wash each other out when combined. Very weird. I still love how cheerful it is. In light of all the other projects I was finishing, I went back to the Slam-and-Swear table loom, and finally finished the project that I started first. This might have been partially inspired by Andrew promising to fix it's quirks once my weaving was off of it. 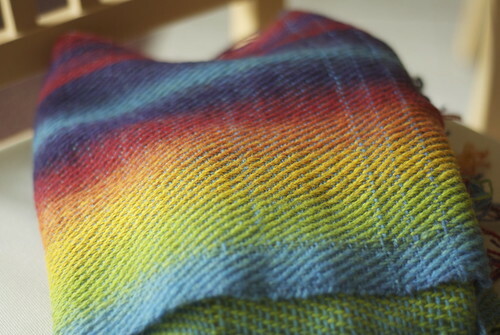 Finished Project #5: Rainbow Kauni, twill weave. It has problems. Missed warp threads, mis-thrown passes, tension issues. The errors are many and glaring. While I was busy hating my poor handwork, Mom pointed out that it was technically a First. "So WHAT if it isn't perfect?" Mom said, being totally reasonable, "It's a learning piece." I still don't love it, but there is value to learning, and practice, and not being good at something right away, right? The best thing, other than having made a few beeeeeeautiful scarves, is that the concepts from the Cricket translate to larger looms! Once I had gotten a project or two under my belt on the Cricket, I could see the warping issues on my table loom and I could read my weaving (a little). I'm not perfect at it, but you know what? I'm enjoying the process immensely. I think your weaving projects are beautiful!! :-) I *might* have to get a cricket one day. Thanks for the "learning" reminder and the inspiration! Darnit, you're making me want to fiddle with my Flip some more. I don't have time! Sigh. Dang, this really makes me want a loom! I want a loom on the account of it being Monday. ktxbye. Seriously though, that houndstooth scarf might just be the last straw for me - it is freakin' beautiful! I want a loom now so I can eat through my stash and also make useful, pretty things. Any suggestions for a first loom? I have never thought I wanted to be a weaver until I saw your Houndstooth...gorgeous! Congratulations on staying with the process, learning as you go, and having 5 beautiful FO's to show for it. Thanks as always for creative inspiration. When you talked about weaving on the podcast, I tuned out a little bit, but after seeing these projects my interest is definitely piqued. They're all so beautiful! I listen religiously to your Podcast and always hear you talking about your Cricket loom. I want to get one, your projects are beautiful and only you would know there are problems are. It makes them unique. Will you be coming back to MD Sheep and Wool anytime soon? Jasmine, I'm a long time listener to your podcast. Until recently I did not knit, but listened to knitting podcasts just to hear about yarn and fiber while I weave. I've been weaving for over 30 years and have 4 floor looms. If you love weaving, you must get a floor loom. They are so much easier to work on you'll wonder why you ever struggled with anything else. It's the main piece of advice I give any new weaver --- Get a Floor Loom! You'd think that table looms and ridgid heddle looms would be easy, but they are not in comparison. they are fiddly becasue they are small. It's hard to get good tension on them ever. Thanks for all you and your fellow podcasters have done to encourage my knitting, now I'd like to encourage your weaving. Keep up the good work! I almost bought the Cricket at Camp KIP, but held back, wanting to do a little more research. I ordered one and then cancelled, not sure if I would outgrow it too quickly. But today I finally made up my mind and ordered a 20" Flip. I am so excited and inspired. I love seeing your projects and your learning curve. And your new blog!